The same year, Lloyd played in her first FIFA Women’s World Cup tournament. Heading into the tournament, the national team had not conceded a game in regulation time in nearly three years and was considered a favorite to win the tournament in China. During their first match of the tournament, the U.S. tied North Korea 2-2. The team faced Sweden in their next match on September 14 and won 2-0 with two goals from Abby Wambach. The U.S. finished group play with their 1-0 defeat over Nigeria women’s national football team on September 18. During the quarterfinal match against England on September 22, the U.S. won 3-0. All three goals were scored within 12 minutes. The U.S. faced Brazil in the semifinal in what would become a controversial and game-changing match for the team. Coach Greg Ryan decided to bench starting goalkeeper, Hope Solo, and instead started Brianna Scurry, a veteran goalkeeper who had started in three World Cups and two Olympics, but who had started very few matches since the 2004 Olympics. The U.S. was defeated 4-0 by Brazil. The loss relegated them to a final match against Norway, which they won 4-1, to secure third place standing at the tournament. Lloyd started three of the five games in which she played at the tournament. Throughout 2007, Lloyd started 13 of the 23 matches in which she played. She ranked third on the team in scoring with nine goals and three assists. During the championship match of the CONCACAF Women’s Olympic Qualifying Tournament, Lloyd scored the U.S.’ only goal during stoppage time on a free-kick. The U.S. eventually defeated Canada 6-5 in penalty kicks. She scored two goals during the 2008 Olympics: the game-winning goal in the team’s 1-0 defeat of Japan during the tournament’s group stage and another game-winning goal in overtime against Brazil during the final helping the U.S. win gold. Lloyd was named the 2008 U.S. Soccer Athlete of the Year along with Tim Howard. She was on the starting lineup in all 35 games in which she played in 2008, tying for the team lead in matches started during the year. Her 2,781 minutes on the pitch for the U.S. ranked third on the team in minutes played. Her nine goals and nine assists resulted in her best scoring year yet on the national team. In 2009, the U.S. national team competed in eight games, of which Lloyd was on the starting lineup in five. At the 2010 Algarve Cup, Lloyd scored the game-opening goal in the final helping the U.S. clinch the championship title after defeating Germany 3-2. Although she suffered a broken ankle in the fourth game of the 2010 WPS Season while playing for Sky Blue FC, she played in 15 matches for the United States in 2010, starting 14. Lloyd started all five games at the 2010 CONCACAF Women’s World Cup Qualifying Tournament, scoring two goals, including the United States’ lone goal during the championship match. She ended the tournament with five assists and was named the Player of the Match three times during the tournament. After the U.S. finished third at the tournament, they traveled to Italy to vie for a place at the 2011 FIFA Women’s World Cup in the UEFA-CONCACAF play-off against Italy. Playing every minute of the series, Lloyd scored three goals with five assists during the series. She earned her 100th career cap during the second leg of the series. At the 2012 Summer Olympics in London, Lloyd scored the go-ahead goal in the 56th minute of the team’s opening match against France, to boost the U.S. to a 3-2 lead; the match ended with a final score of 4-2. She scored her second goal of the tournament against Colombia during the group stage. During the Olympic gold medal match against Japan, played at London’s Wembley Stadium, Lloyd scored both American goals in the team’s 2-1 victory. Her four goals in the tournament tied for the second highest on the U.S. squad. She is the only player (of either gender) in history to score the game-winning goal in two separate Olympic gold medal matches; her first occurred during the Beijing 2008 final against Brazil. After scoring her 46th international goal in the 13th minute of a friendly against New Zealand in October 2013, Lloyd became the highest-scoring midfielder in the team’s history, passing Julie Foudy, who finished her career with 45 goals. Lloyd has done philanthropic work for the Habitat for Humanity. Lloyd is sponsored by Nike. 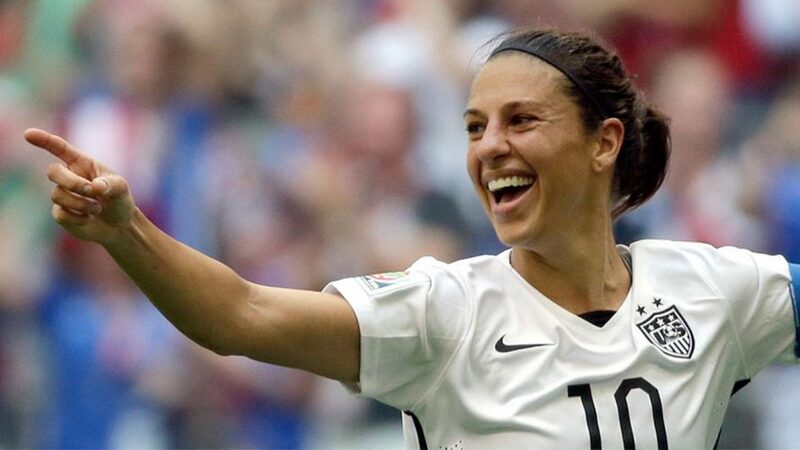 In 2011, she was the focus of a promotional feature for the sports company entitled, Pressure Makes Us: Carli Lloyd. She is a non-paid endorser for Advocare. She has made appearances on Good Morning America, The Daily Show with Jon Stewart, and Live with Kelly and Michael. In 2012, she appeared in an ESPN feature called Title IX is Mine: USWNT. Carli Lloyd is two-time Olympic gold medalist in professional soccer. She is in conversation with Namita Nayyar, President Women Fitness.